It has been a couple months since I posted an update for you all about Brawl, and in the meantime, we've been watching, gathering data, hearing feedback, and generally learning a lot about this format. So, I wanted to check in with you, let you know where we're at, and announce a few changes as well. Sound good? Let's get into it! I'm happy to report that Brawl continues to do well. Over the past month, I've been at three of our birthday Grand Prix, and seeing so many casual Brawl games get played—as well as being invited to play in several more—has been wonderful. I've walked into stores to see people brawling, heard plenty of chatter about it on Twitter, and read a good number of articles. Brawl is alive and out there! And my experience isn't unique. I've talked to and heard from so many people who have incorporated Brawl into their gaming groups. That's awesome! But let's not use my random personal anecdotes for this. That can be misleading. Let's take a look at our data! In our recent set assessment of Dominaria (those polls people fill out about the set), we received data from thousands of Magic players. Just over 20% of Magic players who responded are playing Brawl, which is extremely impressive for a brand-new format! It usually takes a while for these things to catch on, so to see it at this level already is very promising. We'll be monitoring this number to see if it goes up or down in the future, and learning from it. We also put out a Brawl survey a little while back to gather feedback on the format specifically. You told us what you wanted, what you liked, and what you didn't like about the format. I've taken a look through all of those comments and wanted to address a few things. A big and loud note was that players are having fun with Brawl—and that you wish a few missing tools were available. When we launched Brawl, it was a test to see if this would be interesting for players. And quite frankly, the reaction blew us away! We want to support it as much as possible. The first way we can support it is on the card design angle. Between us playing it a lot and the tremendous amount of feedback we've received, we're heading in a good direction here. Some of the things we anticipated ahead of time, so we already have some designs just around the corner to help out. For example, we're looking at things like making sure upcoming sets have the right spread of colored legendary creatures and planeswalkers (especially at the fall rotation) to make most color combinations playable, ways to improve Brawl two-color mana bases, and getting more of those big, splashy effects (like sweepers) into the format. As purely an example, an eight-mana multiplayer-focused board sweeper is unlikely to impact Standard but helps clean up the Brawl board. And this is all great news for Commander players, too! What's good to print for Brawl is generally good for Commander, different legendary color combinations and splashy spells being just two examples. We have discussions like this on our mind. You just saw one big example of this with the Elder Dragons in Core Set 2019. While they weren't designed to be Brawl commanders in particular, their existence is the kind of thing that, while looking over sets, we are actively seeking to include. The second kind of support is the kind that shows up in-store. Since we really were testing it with Dominaria to see what happened, we didn't have anything significant lined up for in-store support aside from allowing stores to run Brawl events and games. With the outpouring of people playing and excited about the format, we've now locked Brawl in as a format going forward, and supporting it in stores is absolutely something we intend to do. Interestingly, a lot of feedback is split between people who think Brawl is thriving and have been playing it at their stores, and people who tried to play at their stores but couldn't get people to play with them. It's been very pocketed so far, and we all agree that having consistent in-store support would help with that. In the meantime, I hope you will continue to do what so many Magic players do so well: build a community and get people interested in the format. While I can't reveal exactly what we're doing just yet, I wanted to let you know we are working on additional Brawl support. It's going to take a little more time to be ready, but I am very excited for when it hits. This has always been one of the most discussed topics of Brawl, and I wanted to make sure to touch on it again here. When we last talked, I spoke about how Standard is core to Brawl's philosophy. One thing I was very curious to see is how our data came back on the Brawl survey we ran. And we received a great deal of feedback in the Brawl survey from all sides, including a gigantic amount of people who appreciated that the format did rotate and that they don't feel like they are going to play against the same things over and over forever. Granted, because a rotation hasn't yet happened since Brawl was implemented, it is impossible to say for sure. Which is precisely why we are carefully watching as Guilds of Ravnica approaches. I don't have a ton of updates for you here otherwise, but I wanted to make sure to mention rotation since notes on all sides comprise a huge chunk of the questions I'm asked. I will reiterate that it is and continues to be our intention to keep Brawl with a Standard card pool (banned list aside). There are a lot of great non-rotating formats, such as Commander, and if you prefer them, that's totally fine; Magic has lots of great formats. (And to say this once more: Commander is not going away, this isn't taking anything away from Commander, and we are absolutely going to keep doing Commander products.) I really appreciate the feedback from all sides here, and we will continue to keep our eyes and minds open. Thank you! After the last round of updates, we said that we would be carefully monitoring the format and wouldn't be afraid to jump in and try out more tweaks if needed. It really is an evolving format! Multiplayer Brawl looks pretty healthy. Multiplayer games are always great at self-balancing; there are certainly plenty of strong commanders, and a great deal more are viable. The last changes to 1v1 Brawl, for that format, were a mixed bag. The banned list change was great, and I've happily seen you all casting plenty of innocent Attune with Aethers and Rampaging Ferocidons. Some other changes may have swung the pendulum a little too far, however. We've heard a lot of feedback about this. Additionally, there is one other thing we've noticed and wanted to tweak as well. Here's Ian Duke as a Play Design representative on Brawl, with Play Design's notes and some upcoming changes to Brawl that we both worked on. Take it away, Ian! In our most recent update to the Brawl rules structure on May 10, we made several changes, many of which were aimed at balancing one-on-one play. With the evolution of the Brawl format still in its early stages, we planned to monitor the effects of those changes on the metagame and provide further updates if needed. While we're happy with how many of the changes have played out, such as the update to the banned list and support for colorless commanders, we do see further room for improvement in the 1v1 Brawl rules set. In the May 10 update, we adjusted the starting life total for 1v1 Brawl to 20 (down from 30, which still remains the starting life total for multiplayer). The goal of reducing life total was to help address the dominance of blue-based control decks and to line up the rules set with one-on-one Standard play, which the card pool is balanced around. Since that change, we've been gathering feedback from local metagames across the world, as well as from Magic Online play. With the starting life total at 20, we've seen the 1v1 Brawl metagame take a large shift toward low-curve aggressive decks, especially mono-red using Kari Zev, Skyship Raider as a commander. 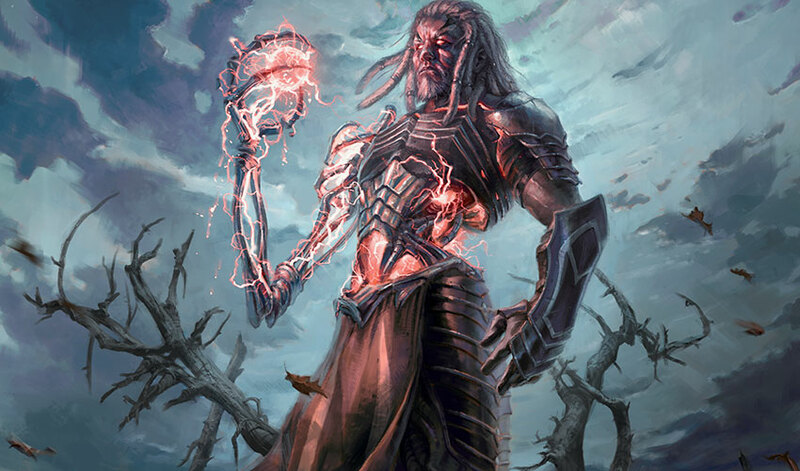 Mono-red has been dominating Magic Online play in terms of popularity and win percentage, and we've heard similar feedback from local play groups. While Brawl shares the Standard card pool and has similar gameplay patterns to Standard, one of our balance goals is that Brawl games play out a little slower so that players can enjoy additional synergies and combos by building around their commander. To this end, we are once again adjusting the starting life total for 1v1 Brawl up to 25. This will strike a better balance between aggressive and controlling decks, allowing players to "go bigger" with synergies and higher mana cost cards when not under so much early-game pressure. The second change we're implementing is that each player is allowed one free mulligan in 1v1 Brawl. This means that the first time in a game that a player chooses to mulligan, they will again draw seven cards. After that, they can choose to continue to mulligan, each time drawing one fewer card. Once a player keeps their hand, if they kept six or fewer cards, they scry 1. There are two major reasons for this change. First, because of Brawl's (relatively) small card pool combined with singleton deck building, we've observed that it can be difficult to include the right density of certain types of effects, like early plays and creature removal. Allowing a free mulligan will help decks access needed effects with a bit more consistency, especially in the early game. This in turn should put less emphasis on using commanders that are strong in the early game (like Baral, Chief of Compliance and Kari Zev), opening up more choice for players. The free mulligan should also disproportionately help synergy decks that build around their commander compared to those that simply use the strongest stand-alone cards. Looking at our metagame data, those decks will appreciate the boost. This is in keeping with the philosophy of making Brawl a little slower and more synergy based. In all, our expectation is that access to a free mulligan will allow for greater commander diversity, more consistent and interactive early games, and better access to combos and synergies. It should result in a bit less emphasis on stand-alone rate cards, low mana cost commanders, and a high density of early removal. As always, we'll continue to observe the results of these changes and listen to community feedback. We're invested in the long-term success of Brawl and believe that being willing to experiment and make changes is key to perfecting the recipe. We will be continuing to monitor the format and make quick changes if needed. It may ultimately end up that going back to 30 is correct—but as the format continues to evolve it's worth trying this and finding out. So, when will you one-on-one players get a chance to try these changes out? Last time, for example, they took some more time to show up on Magic Online. Well, fortunately, we've done some work, and they will be showing up soon—very soon, in fact! These changes both go into effect everywhere, including Magic Online, starting on July 11. That's two days from today! So get your new Core Set 2019 legends (might I suggest some Elder Dragons? ), shuffle up, and get ready to play! Also, please keep the feedback coming. The changes and notes from this article wouldn't be here without your honest thoughts. Please let me know what you think! If you have any questions or thoughts, you can reach me by sending me a tweet, asking a question on my Tumblr, or emailing me at Beyondbasicsmagic@gmail.com.